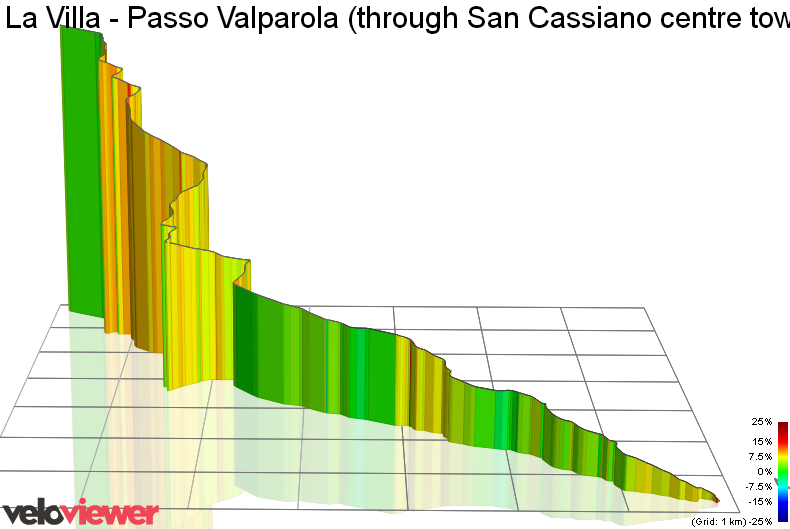 The Passo Valparola is the nearest climb that starts from my home…and it is the one that I ride less. Maybe it’s because of its length or because I’m just not able to warm up enough to ride it at a regular pace in the 3km that separates my doorstep to the start of the climb. Some cyclists calculate the start of the climb from the town of Armentarola, others from San Cassiano. 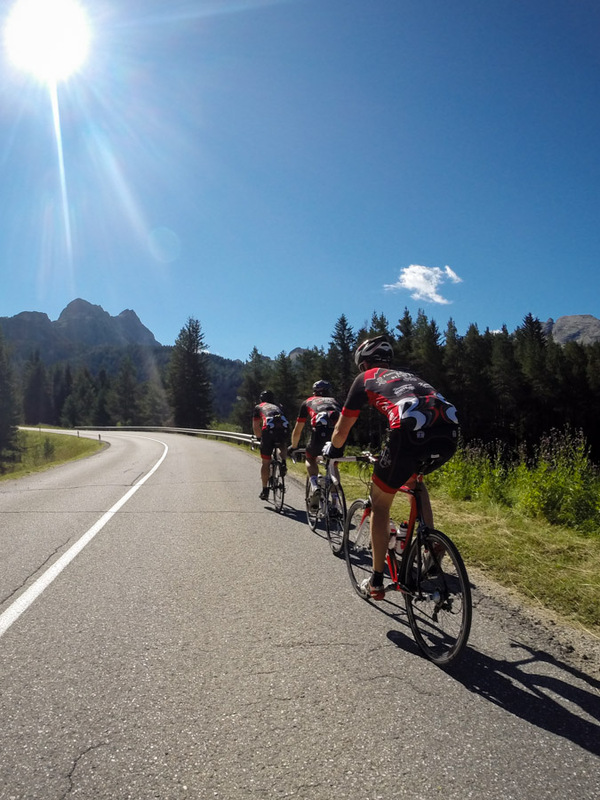 But the real climb actually starts at La Villa – and this is a portion of the ride that you shouldn’t underestimate because, as always, your legs will already be telling you how the day will be right from the start. From La Villa you take the road that goes to San Cassiano. Take a short descent, pass a bridge and you’re at the first 4 hairpins. And, where there are hairpins, there is usually a nice gradient. The gradient of the first km is between 7%-8%, enough to make you feel the pain if you come from a long descent or start without a bit of a warm-up. After the hairpins, the next 3 km towards the town of San Cassiano just have a gradient between 4%-5%. Once you arrive at the roundabout just outside the town you have 2 choices: 1) go right, skip the town of San Cassiano and you’ll head to a nice 13% ramp; 0r 2) go left and go through San Cassiano (where you can fill your bidons at the water fountain near the church, if needed). The climb is nicer if you take the 2nd choice. Once you intersect with the road that skipped the centre town of San Cassiano, you’ll climb towards the hamlet of Armentarola. Here’s where you can take your last breath before the Passo Valparola starts! The road descends gently and you can build up some speed in order to ‘fly’ over the 1% gradient uphill towards the ‘Saré’ bridge. From this bridge, in the distance you’ll see the road that gets steeper along a long, right turn. From here onwards, as you climb the Passo Valparola, you’ll be riding through a nice forest. To your left you’ll see the Conturines mountain range getting nearer as you ride the first hairpins (great place for pictures). Then the road follows the natural contour of the mountain and takes you south. The road on this portion of the ride can be really bumby during certain times of the year due to continous landslides. 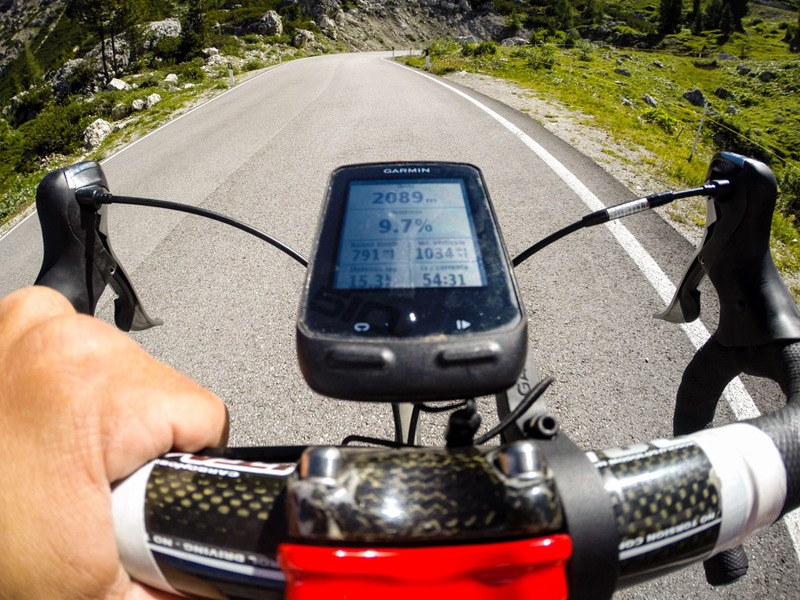 At certain points you’ll need to pedal out of the saddle in order to gain some speed. 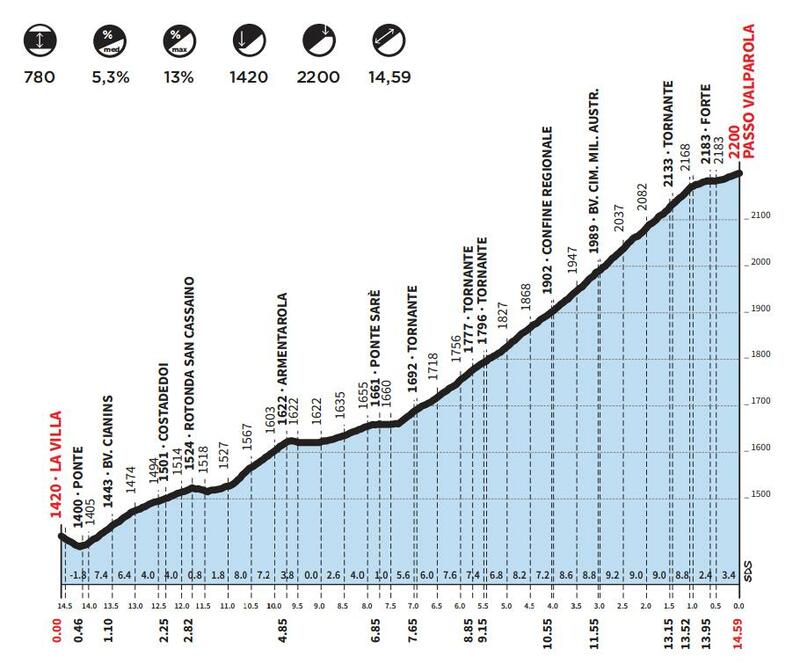 Up to here, those of you in good shape will be pushing hard and the Passo Valparola will feel like a normal climb. 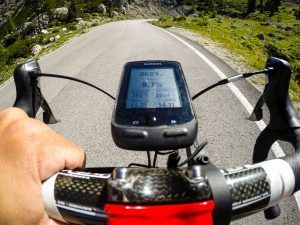 Those of you with less training will start to feel the fatigue because of the length of the climb. It gets interesting at 3/4 of the climb. On your left side you’ll see the Alta Badia Good Bye sign (you’re leaving the Alta Badia area) and in front of you the road turns left. Here things start to get serious with a 10%-11% gradient. No hairpins to let your legs breathe for the next 1.5 km. You won’t even notice that you’re gaining altitude and the forest trees are slowly disappearing making way for the famous lunar landscape of the Valparola. Finally, a first right turn, and from here you’ll have an amazing view of the entire Alta Badia Valley all the way down to La Villa where you started. From here you can count just 4 hairpins to the Valparola Hut, but hold on – that’s not the top of the Valparola. If you’re riding to achieve a good time on the Strava segment, you’re going to have to push farther for the final 1 km on flat terrain because the Valparola sign is only at the end of it. Along this portion, you’ll see the 3 Sassi Austrian Fort build during World War I on your right and an amazing lunar landscape in front of you. Once at the top of the Valparola you find yourself in one of World War I’s ‘hot-spots’. If you stop at the 3 Sassi Fort and look west, you’ll see the Marmolada glacier. In between is a mountain with a huge a cone-like hole on its front side: this is the Col di Lana where over 8,000 soldiers lost their lives because the peak was mined. 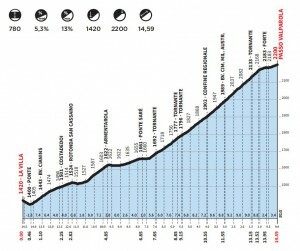 From then on it was called the “Col di Sangue”, or the “Blood Mountain”. It is worth stopping at the Museum in that area because the Dolomites are not only a nice place to cycle, but a place full of history, as well. I am in america,USA. planning atrip to beautiful Italy. I am having a difficult time finding a road bycicle rental store. I’ll be arriving in Alta Badia by September 21 and want to have our rentals already reserved. My first time there, wonder if you have any suggestions and recommendations. We will be in the area for 4 days and would like to try a few climbs. Thank you for your great input of the surrounded areas.greatly appreciated.